The Chanel Golden Class Double CC Line and Trendy CC Line are both the new classics. They return every season and the collection has been expanded from shoulder bags to WOCs and now wallets. These styles are actually the modern accessories of Chanel and they’re huge success. Now meet the Chanel Golden Classic Double CC Long Wallet, the name already reveals its secret. The wallet is embellished with a 3D double CC logo attached to a golden plate. This design is becoming another signature of the house. Together with the logo, the body is made with diamond quilting for the elegant look. While the wallet appears to be modern, the quilting balanced it with some classic appeal. This is a long wallet, meaning it can be used as your daily companion. Slip it inside your bag and when you pull out at the checkout, it’s an effortless brag. 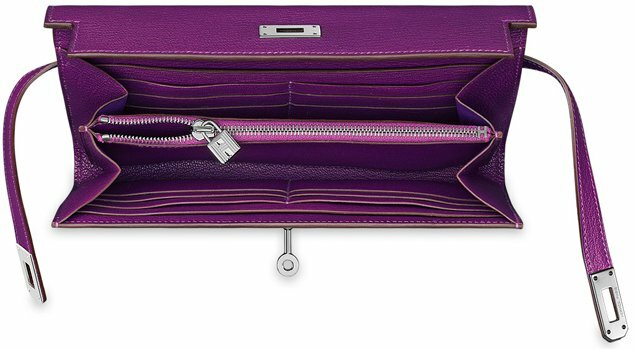 The inside is made with central compartment, card slots and zipped pocket. There are also different colors available, but you need to check with the boutiques for the options. Made from grained calfskin leather, it’s as durable as caviar but not as hard. The wallet has a smooth but grainy touch, which feels luxurious. It’s perfect for the fashionable woman. Style code is A80768, measuring 4.1’ x 7.6’ x 1.2’ inches, priced at $1300 USD, €1250 euro, £1080 GBP, $1920 AUD, $10100 HKD, $2010 SGD, ¥9900 CNY, ¥158760 JPY via Chanel boutiques. Tell us your ideas; is this wallet worth your investment? If your wallet is ‘overloaded’ and your hands are ‘itching’. You can’t control your shopping addiction, it’s going wild and it needs an injection of luxury in order to keep it down. And for those fashionista’s that are working day and night, sometimes you need to find a reason why you have been working so hard, a little treat for yourself will keep you fire burning and motivated. And for the girls running with a broken heart, replace your ex with the Hermes Kelly Long Wallet, it can be done, it’s possible. Perhaps a price that’s too steep, but it’s certainly one of the best wallets you can ever get. With DNA copied from the iconic bag that everyone wants, the Hermes Kelly Tote is protected with two or more layers of waiting list (sometimes the waiting list is even closed!). You can recognize the elements of the Kelly on the shape, the impeccable leather and of course, the elegant ‘Kelly Closure’ on the front. It’s an accessory that will make everyone jealous, a wallet that gets instant attention when carried in an open room, I mean, anyone that knows a little bit of fashion will understand that it’s a Hermes Kelly Wallet. Pick your favourite – either in goatskin or Epsom calf leather, if you got doubts then check our Hermes Leather Guide. The wallet can be closed using the straps, made with silver detailing.